I warned you this was coming folks, so don’t be surprised. Today delivers you the final blog post in the series. Today is about wrapping up everything we’ve learned into an effective recruiting tool and putting a nice bow on our new knowledge of the candidate’s market, Millennial job seekers, posting vs attracting and finally, the anatomy of an effective job post. 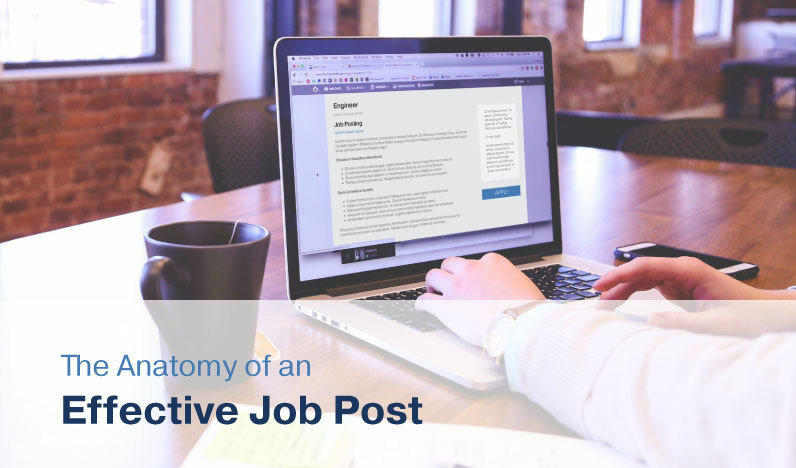 We should now understand that an effective job post can be the biggest tool in your recruiting arsenal when done right. So how do we know when we’re doing it right? Sheer numbers are just not enough these days. Let’s define effective. Encourage the effort of an application. Provide a candidate base and a hire. Do these results look and sound the same? They’re not. Think of the most difficult position you will need to fill this year. Think of the perfect candidate. Now, turn that perfect candidate into a fish. You need to know where in the pond this type of fish lives. You need to toss them the right bait to get some interest. You need to be flashy or attractive enough to get them to bite. You need to get a few into your boat and pick the best one for dinner. Perfect analogy? Nah. I’m just hungry. True story. But regardless, with a little forethought and judicious effort we can create great job posts that will do all these things. So let’s get into it. You do not need to be Tolstoy to write a great ad. What’s important is brevity, clarity and honesty. Three words that mean the same thing? Well, kind of. But an ad’s greatness lies in relaying your story quickly, clearly and attractively. Job seekers will either dismiss or consider an ad in seconds. It’s not a considered reaction, it’s a visceral reaction. The ad needs to speak to them at a personal level and capture them quickly. How do we speak to job seekers at a personal level? How about addressing them personally? Most ads are like a conversation with a 3-year-old. Dominated by “I want this,” “I want that,” “I need you to do this or I won’t get you that.” We all know those conversations inevitably end up with tears or cold SpaghettiOs in your hair. Usually both, if you’re me. If we address the candidates directly, we stand a better chance of having them play along. Use the words ‘you’ and ‘we.’ “You will manage our national sales team of seasoned producers.” “You have the opportunity to earn your Master’s Degree while managing the supply chain.” “You will collaborate with world respected industry leaders.” “We are proud of our team’s success.” “We need your expertise to grow to the next level.” Make it personal. If the candidates can see themselves in your position, it will trigger interest and action. Let’s talk about our message. Put yourself in the candidate’s shoes for a minute. They’re likely overworked, possibly unemployed, definitely pressed for time and stressed. Now is not the time to get nifty with them by tossing out cool buzzwords and jargon. The only time any company should be “Looking for a Unicorn! !” is if they are actually putting together an expedition to the interior of Irian Jaya to locate and capture a real unicorn. This generation of job seekers are masters of the eyeroll and the kings and queens of cynicism. Please try to avoid patronizing them. They might apply to your ad as Princess Fiona just for spite. Clear job titles, accurate job descriptions, meaningful company information are all integral to a solid ad. Job titles should reflect the role. Don’t call a “Sales Manager” a “Business Promotion Initiator” because… well, because that’s actually not a thing. “Sales Manager” ads will be picked up by robots, spiders and other internet AI tools and delivered to the inboxes of candidates looking for “Sales Manager” positions. That’s our goal isn’t it? Appeal to the right talent. As Brussels Boy once said, “Aim small, miss small.” Let’s think about attracting the correct profiles to our postings. Job descriptions need to be specific. Keep in mind, a job description is not a wheezing list of what you want. A job description should engage the imagination of potential candidates. They should highlight specific tasks. They should be job related. “You will be responsible for managing and growing a successful team of field sales professionals in the national arena.” They should focus on actions and results. “Use your experience to train and motivate new hires in your department.” When you are formulating your job description, think of what attributes and experience would make a person successful in that position. Craft your story around those specific attributes. Leave out anything general, non-job-related or exclusionary. Now that we have the attention of the correct demographic, how do we get them to bite? Well, to quote an industry legend, “Focus on the Why.” Why should they apply? Why is this the correct career move for them? Why would they fit into this culture? Why would they be foolish not to apply for this outstanding opportunity? This is your chance to sell. This is your opportunity to court the candidates with your company’s story, perks, benefits, culture, advancement opportunities, bonus plans, stock options, 401K match, PTO plans, continued education, company gym, casual environment, stocked kitchen, and work-life balance. Finally, the last piece of an effective job posting highlights your company. The “About Us” statement is a great tool with which you can drive home important information to attract an application. Utilize this section to identify your products, your service, your mission. Crow about company awards, values, achievements, and your exemplary culture. Detail your stability, growth, technology and workplace. Be forthright and honest. If you believe this is a great place to work, candidates will believe it as well. If you believe this is a great opportunity for someone, they will believe it as well. So there you have it folks. Put this information to good use and you will have a head-start on the competition. If you’re interested in more, check out our recorded 30-minute webinar on the candidate-driven market and some of your options in today’s recruiting environment. Patrick McLaughlin is a hirsute and elusive Talent Acquisition Professional. Cryptozoologists have unsuccessfully attempted to capture him managing MEA’s Recruiting Services from his bower somewhere in the North Woods, where he has developed successful recruiting teams utilizing innovative best practices and bullet-proof fundamentals. Don’t ask him how he knows about the interior of Irian Jaya, he won’t tell you. Most recently Patrick has developed a core selection of Recruiting Products designed to alleviate MEA Member’s growing pains when it comes to Job Posting & Advertisement, Sourcing, Recruitment and Staffing.